These files are used to determine physical layer parameters like antenna gain, thermal noise, target BLER etc. and to enable/disable the computation of shadowing, fading, interference from other cells and so on. We are ready for setting up our first simulation scenario. 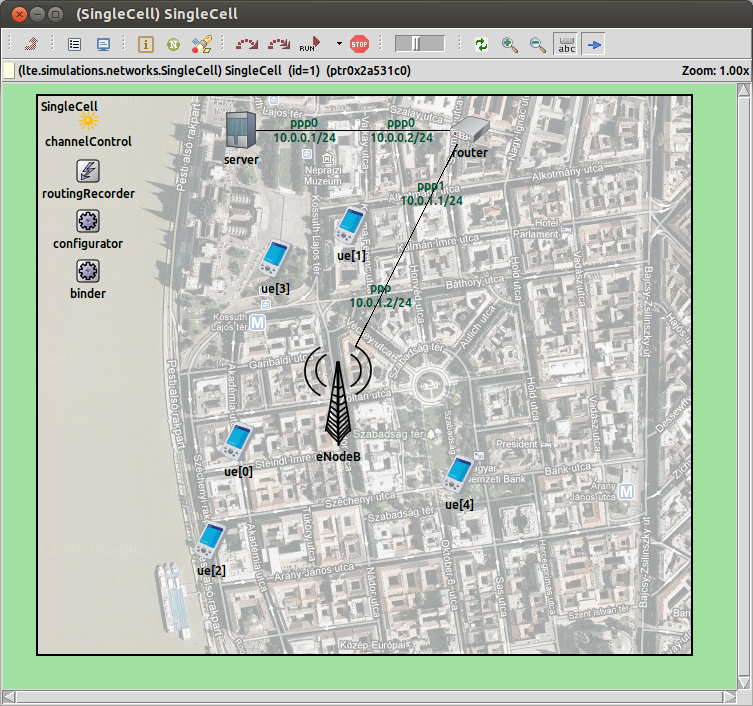 In the omnetpp.ini file, we create a new configuration called SingleCell. The network model (defined in the simulations/networks directory) contains one eNodeB serving a variable number of UEs. UEs need to communicate with a server located on the internet. Thus, we configure the server so as it runs as many application as the number of UEs. UEs must be associated with the eNodeB, by setting macCellId and masterId parameters (eNodeB IDs are assigned progressively, starting from 1). Mobility parameters (i.e., initial position and mobility type) are also specified both for the eNodeB and the UEs. We have not yet defined the type of the traffic. We obtain two different configurations by extending the previous one: one for the downlink direction and one for the uplink direction. In this example, we use VoIP traffic model. The main difference between downlink and uplink is the modules where the VoIPSender and VoIPReceiver applications are located. Destination addresses and port numbers must be set such that one sender application can unequivocally identify the receiver application.